Yellow Jacket wasps are social wasps serving a queen and are very protective of the nest. Wings are folded longitudinally when at rest. 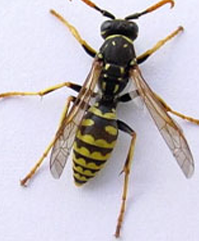 Yellow Jacket wasps live in colonies and are social wasps. This means that they are extremely protective and will become aggressive if they perceive their nest to be threatened. Nests are typically built on trees, shrubs, overhangs, and other voids or cavities caused by human habitation. Workers are capable of multiple stings and can cause injury and serious pain if you accidentally stumble into a nest. 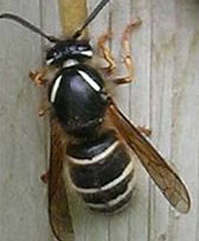 Colour pattern is black and white on face with angled white stripes on thorax and abdomen. Very large and aggressive hornet. Bald-faced hornets are social hornets and build their nests in trees and shrubs most commonly. They are very protective of their nests and colonies, and will inflict serious pain/ injury if provoked. Colour varies from yellow to black and will sometimes look metallic. Very long thin stem attachment to back abdomen. Wings are clear or black in colour. Mud-dauber wasps do not live in colonies because they are not social wasps. They do not defend their nests the way most social wasps are known to do and therefore rarely sting. 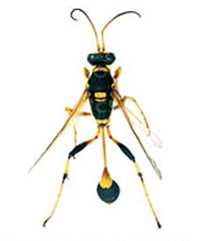 Mud-dauber wasps can be very beneficial, as they eat many other insects and spiders. If they do not pose a threat to you or your family, please consider leaving the nests where they are. We serve Kitchener, Waterloo, Guelph, Mississauga, Brampton, Owen Sound and other surrounding areas with professional pest control services.